Forklift Certification Atlanta, Get Forklift Training in Atlanta Today! With a population approaching 400,000, Atlanta is the most populous city in the State of Georgia and also its capital. When it was established in 1837, there was little more to it than the intersection of two railway lines. Today, it is the cultural and economic center of Greater Atlanta, home to more than five million people, many of them with Atlanta forklift training. If you’d like to land a well-paying forklift job in Atlanta, you need forklift training classes in Atlanta, GA. No other training provider offers the convenience, complete certification requirements, and affordable prices of CertifyMe.net. It’s easier than ever to get your forklift training in Atlanta – CertifyMe.net can show you how! Atlanta is the 17th largest economy in the world. As such, it provides the person with forklift certification in Atlanta with an almost unlimited selection of opportunities for employment. Two of the city’s most prominent employers in the forklift training, Atlanta, community are Delta Airlines and Hartsfield-Jackson International Airport. 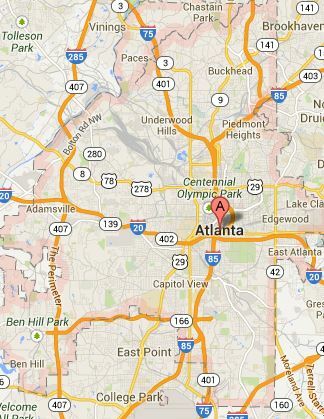 Atlanta is an important transportation hub for the entire southern United States. What’s more, the city is home significant businesses in agriculture, technology, utilities, and other industries. Warehouses, transportation centers, and construction sites are just a few of the workplaces that require well-trained forklift operators. With forklift training in Atlanta from CertifyMe.net, you’ll have the skills and OSHA knowledge to safety operate a lift anywhere in the city! Why Get an Atlanta Forklift Certification? You might be wondering, why it’s important to complete forklift training in Atlanta if there’s such a great demand for operators. The fact of the matter is, because qualified forklift workers are needed throughout the city, the standard of education and credibility of operators is rising. Employers are looking for the best of the best when it comes to forklift training to help them improve their productivity, perform top-notch tasks, and avoid fines from OSHA. With forklift certification classes in Atlanta from CertifyMe.net, you’ll give yourself the best possible chance to land a great career. It all starts with OSHA forklift certification in Atlanta with CertifyMe.net. Headquartered in Atlanta, GA, Delta Airlines employs 80,000 workers to handle more than 5,000 flights every day. Founded in 1929, Delta now has hubs in 11 countries, including the Netherlands, France and Tokyo. Delta regularly advertises for qualified staff with forklift certification in Atlanta to serve as baggage handlers and freight handlers. Of course, not all cargo and baggage handlers work for Delta Airlines. There are numerous freight companies based at the airport as well. These roles also require forklift training in Atlanta GA. Forward Air, Inc., on International Airport Drive; Universal Cargo Management on Glen Iris Drive; and Atlanta Logistics on Stonebridge Drive all advertise regularly for folks with forklift certification in Atlanta GA. Some employers that require forklift training in Atlanta, GA may ask specifically for people with forklift certification in Atlanta who have experience with sit down clamps, electric pallet jacks and cherry pickers. Initial rates of pay for this type of work are sometimes advertised at $13 per hour. These jobs will also give you experience working in shipping and receiving in a manufacturing environment. As you now know, forklift certification in Atlanta is very important to land a great career with a great company. If you’re ready to complete your Atlanta forklift training, you won’t find a more convenient, comprehensive, and affordable online program than CertifyMe.net. Our Atlanta forklift training teaches everything workers need to know to operate forklifts safely, inspect the equipment, assess the environment, and avoid hazards, fines, and costly damage. The program can be completed on any device with an internet connection, in only about one hour, and for only $59.95. Our certification will ensure that you are OSHA-compliant and, as a result, very desirable to potential employers. Complete your forklift certification in Atlanta today! It’s not only required – it’s also a win-win situation for both employees and employers! Begin your forklift certification classes in Atlanta with CertifyMe.net. Our classes feature affordable prices, complete OSHA certification requirements, and you can take your forklift training in Atlanta whenever it’s convenient for you! If you have any questions about our forklift training classes in Atlanta, GA, give CertifMe.net a call today at 1-888-699-4800.